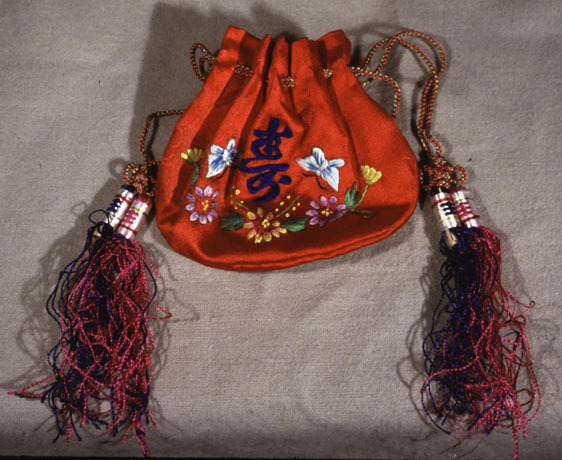 RED SILK SATIN EMBROIDERED DRAW STRING PURSE has two silk pull-tassles on each side, two blue and two fuscia. tassles bound at top in white silk. each have a red and green stripe, one below and the other above a capital "I" symbol with an intersecting horizontal line in its middle which is the same color as the tassle. tassle attatched to green and fuschia silk string which is the drawstring for the top of the purse. a Chinese knot of the fuschia and green sting bind the blue and fuchia tassles together on either side. the pinched top of the red silk satin bag is sewn shut with white tread. Damask silk has a flower pattern woven in it. back of purse has character "Fu" meaning prosperity embroiderd in a thick dark blue silk thread. on the front is another Chinese "Shou" character meaning long life also in a thick silk, dark-blue thread. around this character are embroidered flowers, leaves, and butterflies. there are two purple flowers, one on either side of a yellow and pink flower. the two butterlies are light turquois blue.